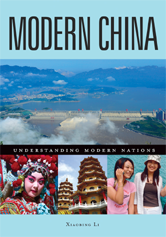 Written by an author who lived in China for three decades, this encyclopedia addresses key topics regarding China, such as its geography, government, social classes and ethnicities, gender-based identities, arts, media, and food, each followed by short entries related to each topic. All the entries are placed within a broad sociopolitical and socioeconomic contextual framework. The format and writing consistency through the book reflects a Chinese perspective, and allows students to compare Chinese with Western and American views.